Gloversville Sewing Center has been Fulton County's one-stop shopping desitination for all things sewing since 1981. We have grown over the years, and now have the largest inventory of sewing machines, fabrics, books, and patterns in the area. Our loyal patrons include customers from Albany, Saratoga, Schenectady, and as far North as the Canadian border to the north, and northern New Jersey to the south. Our average customer travels 1 hour and 20 minutes to reach us, so we feel obligated to make sure we provide the products and services that make their visit "Worth the Trip". Our store is filled with products to make your sewing more efficient and fun. With over 4000 bolts of fabric, we are the largest quilt shop in the area, offering two convenient NY locations (in Gloversville and Saratoga Springs.) to serve our local communities. We carry all the major fabric lines so chances are, if you're looking for a particular fabric style, we probably have it! Our talented team of staff members consists of expert quilters, sewists, and embroiderers. Additionally, we have 2 full time technicians who are the best in the industry. 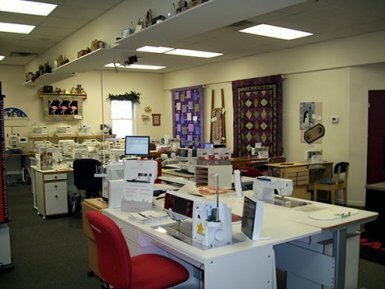 Gloversville Sewing Center is the area's largest Bernina and Janome dealer, with sewing machines on display for you to test drive. Unlike other dealers, we do not limit you to 1 or 2 machine mastery classes. Your training and instruction are included FREE, for life, with your machine purchase. We also offer extended warranty periods, with all labor and tune-ups included. Because we're in the business of inspiration, we strive to provide a friendly, casual atmosphere where sewing enthusiasts of all skill levels feel comfortable and confident as we guide them through the educational process. We take pride in being experts in our field, staying current with the latest industry products, trends, and techniques, so we can pass the knowledge on to our customers. With over 30 years of experience backing us up, we're confident that we have the products and services to meet your sewing needs. But don't take our word for it. Visit one of our two shop locations today and see why our customers come back time and time again!